Philly Teacher: ISTE 2010 Foursquare Scavenger Hunt! ISTE 2010 Foursquare Scavenger Hunt! 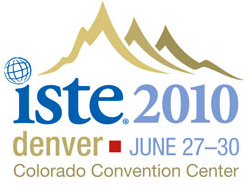 Are you coming to ISTE's annual conference in Denver this year? Make sure you participate in the Foursquare Scavenger Hunt to win prizes and explore the city of Denver and the Convention Center! 1.) If you haven't already, download the Foursquare application for your smartphone. 2.) Find Steven Anderson and Mary Beth Hertz and add them as friends. 3.) Check in at the Conference to get started. 4.) Follow the tips at each location to find out where to check in next. How do I earn prizes? 1) Check in at various places around the Convention Center and the city of Denver that Steven and Mary Beth suggest. 2) When you get to the last check in, you can collect your prize! There are also mini prizes for checking in at 5 different places and 10 different places, and there is a grand prize each day for checking in at all 15 places--a $25 gift certificate to the ISTE Bookstore! Not on Foursquare? Not sure what it is or what it means? Foursquare is an application that uses your location (based on the GPS on your phone) to show you what places are around you. If the place where you are isn't listed, you can add it to the list based on your GPS location. Every time you check in, you get points and it alerts your Foursquare friends that you have checked in at that location. You can also leave tips about a place you visit so that your friends can see what you have to say about it. For more information on the app, click here.